Harold Alanen’s roots run deep into the glacial till of the area south and west of Thunder Bay. His grandparents were part of the influx of Finnish immigrants that arrived here in the early 1900’s. Harold was born in Nolalu, went to school there and later taught at the same school. Harold graduated from Lakehead University and is now a retired teacher/principal. In addition to his educational background, Harold is also an accomplished archaeologist, writer and photographer. Harold’s interest in the history of the area began early in his life. In 1955, his grade four teacher at Nolalu Public School showed the class a stone spear point that a classmate had found in a potato field on the family farm. Harold says that the discussions about the ancient stone tool “kindled an interest” in finding out more about the history of where he lived. This interest continues to this day and has resulted in a detailed look at its history. Native People followed the retreating glacier at the end of the last Ice Age and entered the region about ten thousand years ago. Archaeologists believe that the earliest artifacts that have been recovered southwest of Thunder Bay- many of them found by the writer of the book – are found on the ancient shorelines of glacial lakes that are now a long distance from water. He documents old Native Canadian trails, including a still visible trail that leads up from the border to rich wild rice locations on Whitefish Lake. 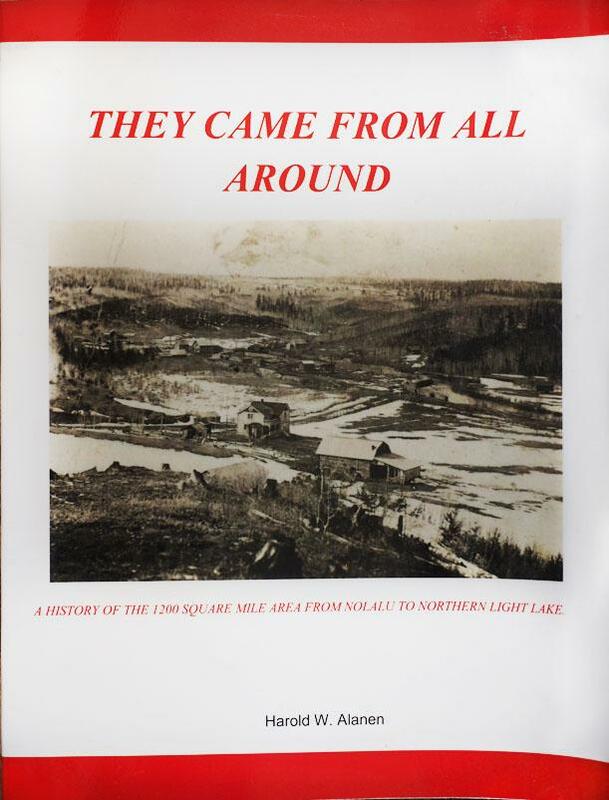 Although the book focuses on the history of the 12,000 square mile area from Nolalu to Northern Light Lake, it encompasses much more that. Harold explains how the glacier transformed the landscape and created lakes, rolling hills and areas suitable for farming. He also gives insights into how immigrants slowly altered the landscape and how communities were formed and adapted to the changes that occurred when mining and logging replaced farming. Although Finns made up a majority of the people in the Nolalu area in its early years, soon immigrants from many countries arrived. This diversity led Harold to use “They Came From All Around” – a lyric from a Gordon Lightfoot song – as the title of his book. The boom in homesteading accelerated with the passing of the “Free Land and Homestead Act of 1868” The description of the growth of resulting communities includes details on the development of churches, schools, cemeteries and the building of the “Outlaw Bridge’ over the Pigeon River. There was a boom in silver mining with the opening of the Rabbit Mountain Mine and other silver mines in 1880’s. Harold traces the development of the “Pee Dee” railroad as it grew toward the Paulson Iron Ore mine just over the border in Minnesota. When the proposed mine failed, the railroad was able to stay alive by hauling silver ore in the later stages of the local silver mines, carrying lumber to area sawmills that had opened along the rail line, taking railroad ties to Port Arthur, and transporting supplies to and from the communities along the rail line. This book describes how this was done in one small part of our verdant country.